Add curry paste. Cook, stirring, for 30 seconds or until fragrant. Add tomato. Stir to combine. Return lamb to pan. Cover. Bring to the boil. Reduce heat to low. Cook for 30 minutes or until lamb is tender. Add spinach. Cook, stirring for 1 to 2 minutes or until …... Stir in the ginger, garlic, cinnamon, curry powder, ground coriander, turmeric and chilli powder. Stir-fry for 2–3 minutes and then add the lamb. Stir-fry for 2–3 minutes and then add the lamb. Stir-fry for 2–3 minutes and then stir in the coconut milk and stock. Add curry paste. Cook, stirring, for 30 seconds or until fragrant. Add tomato. Stir to combine. Return lamb to pan. Cover. Bring to the boil. Reduce heat to low. Cook for 30 minutes or until lamb is tender. Add spinach. Cook, stirring for 1 to 2 minutes or until …... Add diced tomatoes, and cook for 5 minutes, stirring frequently. Then add 4 cups of water and simmer for 15 minutes, or until meat is getting tender. Lower heat. Add curry paste. Cook, stirring, for 30 seconds or until fragrant. Add tomato. Stir to combine. Return lamb to pan. Cover. Bring to the boil. Reduce heat to low. Cook for 30 minutes or until lamb is tender. Add spinach. Cook, stirring for 1 to 2 minutes or until …... Add the curry powder, salt and vinegar and stir thoroughly. Add the lamb and cook, stirring constantly until the lamb is coated with the spice mixture. Add the tomatoes, chillies and mint. The lamb will adopt the flavor of the spices used in the broth, becoming the most powerful component in the curry. 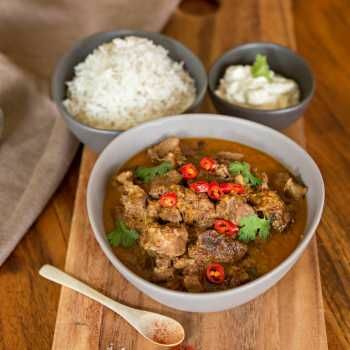 You can prepare lamb curry in a number of ways, but using a pressure cooker tenderizes the lamb meat quickly. 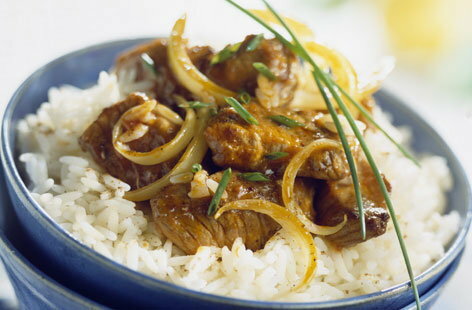 To cook lamb curry in a pressure cooker, you need a variety of spices and approximately one hour. This recipe yields six to eight servings. Add beans and cook, covered for 10 minutes longer or until lamb and beans are tender. To cook the rice, in a saucepan, add 1 cup of rice to 2.5 cups of cold water and bring to the boil. Reduce heat and simmer, covered for 25 minutes.